Literacy is power in horror movies—evil, demonic power. This is a volume in the tradition of the Necronomicon and [Todd and] The Book of Pure Evil. However, it holds the secrets of defeating the supernatural creatures as well as the rites for raising them. Yet, Sophie simply knew it as an heirloom of her late mother’s. Its full significance will be revealed on her 18th birthday in Stewart Sparke’s Book of Monsters, which releases today on VOD. Sophie is a shy, barely in the closet lesbian. Her bestie is Mona is the exact opposite. She and their friend Beth think a wild birthday party is just the thing to help Sophie finally score with her crush Jess. However, things really careen out of control when a shapeshifting demon crashes the party and uses her mother’s evil book to summon five nasty monsters by sacrificing a virgin. So, yes, it will be that kind of shindig. At least Jess’s obnoxious, bullying friends will provide some meat for the grinder. Honestly, the entire film is pretty meat-headed. If we’re going to be pedantic, it really doesn’t make much sense that Sophie and her ineffectual father would have such a sinister relic used laying about the house. Yet, the film’s upbeat energy and goofy humor just carry us along anyway. It is impossible to resist laughing at the over-the-top lunacy Sparke and screenwriter Paul Butler unleash, especially when the young ladies gear-up like Ash in Army of Darkness. It might be Sophie’s party and she can cry if she wants to, but Michaela Longen upstages everyone as Mona, the trampy troublemaker. However, Daniel Thrace probably scores the most laughs as the nebbish torch-carrying Gary, while Anna Dawson camps and vamps it up something fierce, as Sophie’s mean girl nemesis. Book of Monsters has plenty of dead teenagers, but its empowering portrayal of girl power friendships is what really distinguishes it. It is sort of like Nancy Drew and the Hidden Staircase, with more comedic gore and raging power tools. So, what’s not to like? In a weird way, it is refreshing to see a movie about teens where social media is the least of their worries. Obviously, Book of Monsters was conceived as the launch of a franchise—and we’re not opposed. 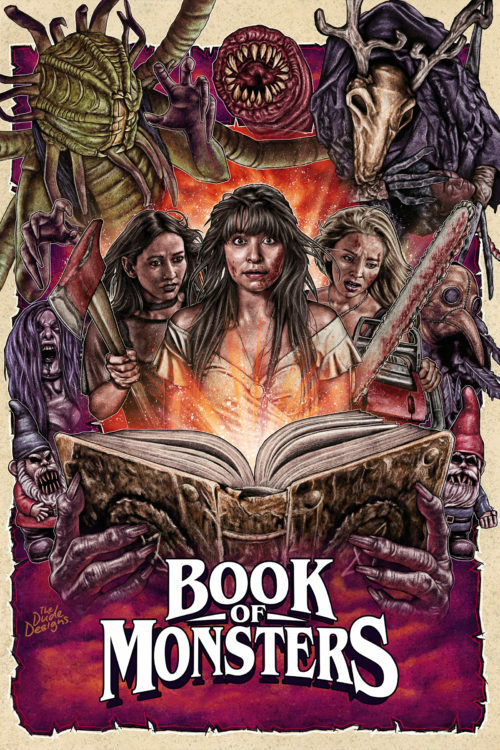 Recommended for fans of gleefully unruly horror-comedies, Book of Monsters releases today (3/19) on VOD.